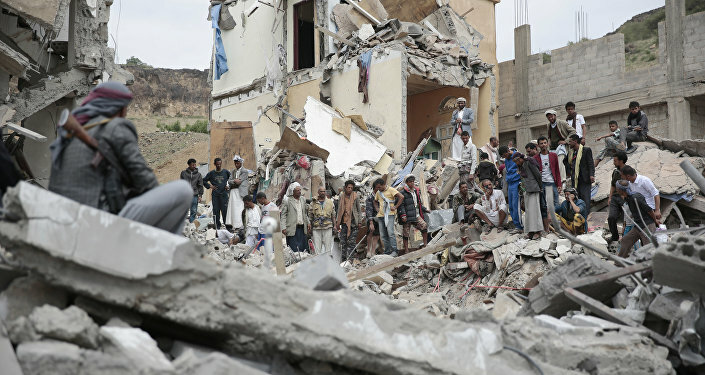 A 41-page report by the Group of Regional and International Eminent Experts on Yemen, which was commissioned by the UN, "strongly suggests" suggests that the Saudi-backed Yemeni government-in-exile, and the Saudi-led coalition, including the United Arab Emirates, "have committed acts that may, subject to determination by an independent and competent court, amount to international crimes." Coalition airstrikes have killed civilians in "residential areas, markets, funerals, weddings, detention facilities, civilian boats and even medical facilities," the UN statement asserts. It notes that the Group of Experts believe such attacks are "in violation of the principles of distinction, proportionality and precaution that may amount to war crimes." The United Nations Human Rights Office says that between March 2015 and August 23, 2018, 6,660 civilians were killed and more than 10,500 injured. However, the Human Rights Council cautions that "the real figures are likely to be significantly higher." International pressure against the campaign has mounted since August 9, when a US-made bomb was used to blow up a school bus, killing 40 children and 11 others. But it apparently wasn't enough: on August 23, a coalition airstrike killed another 29 children and four women who were fleeing in a bus. "I urge all parties to take the necessary measures to remove disproportionate restrictions on the safe and expeditious entry into Yemen of humanitarian supplies and other goods indispensable to the civilian population, and the movement of persons including through Sana'a International Airport in compliance with international humanitarian law," said the group's chairperson, Kamel Jendoubi. The report also alleges that Houthi forces have used weapons with wide areas of effect in urban settings, and, like other parties in the conflict, have conscripted children into armed service. Most civilian casualties, however, have come from coalition airstrikes, the report states. On Tuesday, US Secretary of Defense James Mattis told reporters at the Pentagon that US support for Saudi Arabia in the conflict is conditional on the Saudis doing "everything humanly possible to avoid any innocent loss of life." So far, the Pentagon has not acted to curb its support for the coalition, even as lawmakers try to force its hand. Senator Bob Menendez (D-NJ) has been working to block US precision-guided munitions sales to Gulf monarchies involved in the conflict. "The Department of Defense can't give you a good answer about how it is our assistance is actually making it [the war in Yemen] better in terms of civilian casualties," he told the media. Sen. Chris Murphy (D-CT) on Tuesday said he would introduce legislation to reject the sale of more than 120,000 precision guided munitions to Saudi Arabia and the UAE should the administration press forward with it. A similar resolution to pull out US support completely failed in March, but Murphy is more confident he'll get the necessary votes after the August 9 bus bombing.